It is my opinion that reaching the Gold Medal goal is to be congratulated and those skaters should be remembered for this just as champions are remembered. This is not a complete list of Gold Medal skaters at this point. I will add to this as I receive confirmation on others. 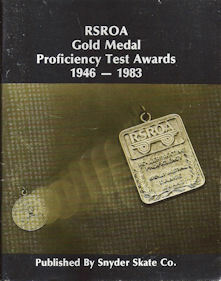 These tests results have been recorded in a book put out by the RSROA for the years 1946-1983, and from Skate Magazines. I am trying to get the test records from 1984-present from the RSA office. This is not an easy task as you can imagine. When looking for the skaters, I have them listed both by the year and alphabetically. Remember the ladies may have different last names since they took the test. Any information on the married or maiden names would be appreciated. I have tried to post those in brackets. Thank you Hazel Inman for helping me with the research. 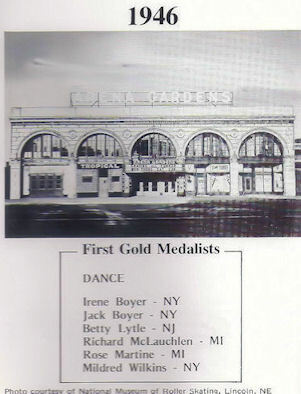 This book was published in 1946 and listed all Gold Medal skaters from 1946-1984. There us is no updated book and are trying to contact RSA for the information on current update. Missing RSA GOLD MEDAL RECORDS for 1989-2005 were moved to the then new office in Indianapolis and are in storage and we do not know if any were published at that time. We have contacted the RSA office and it is being researched presently. Not a speedy job. A big thanks to Hazel Inman for going through many magazines and helping me with this project. *If you have a Gold Medal and you are not listed from 1989 to present, please send the information with verification by your coach, date you took the test, club you represented and the location you took the test. If you have a receipt from your test that would help, as all the skaters listed on this website have been researched and are official recorded medalists. 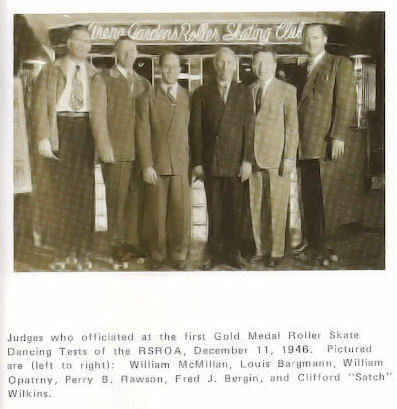 Also if you are now residing in the Northwest and are involved with skating here, and you passed your Gold in another Region please supply the information...we would like to list you.